All outboard motors are hinged to allow varying the angle of attachment of the mostly vertical alignment of the motor, drive train and propeller in relationship to the mostly horizontal plane of the stern of the boat to which the outboard is attached. This adjustment can be manual or mechanical. Most large outboards above 100 horsepower feature electrically actuated hydraulic tilt and trim, most small outboard motors of 40 hp and below have manual T&T. In-between, the standard is manual, but hydraulic systems are an available option. What is Tilt and Trim? Tilt is the mechanism that allows the outboard motor to tip radically forward far enough to raise the part of the motor below the actual engine (called the lower unit) as well as the propeller to the surface or completely out of the water. Tilting the motor up and down is usually done with the motor turned off or in neutral. Trim is the mechanism that moves the motor over a minor range from fully down to a few degrees upward. On hydraulic models, trim is usually activated while the motor is running and in gear. To work properly, the lower unit and propeller of a boat needs to extend into the water deeper than the bottom of the hull of the boat. 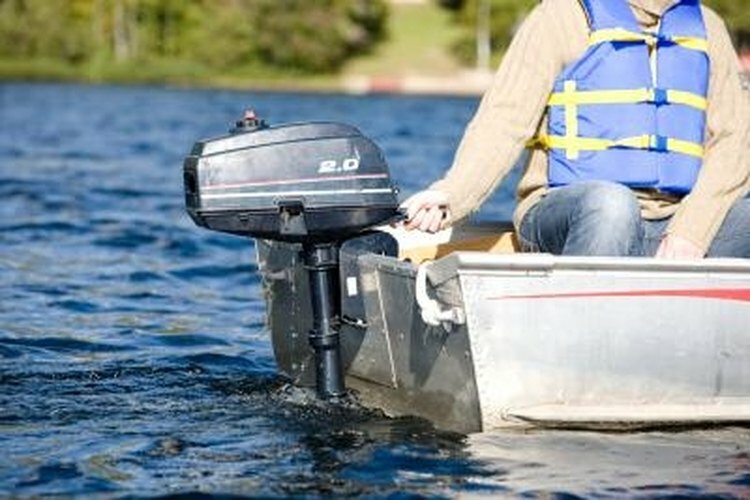 In extremely shallow water or when launching or loading a boat on or off a trailer, the lower unit of an outboard in the tilted-down position could drag on the bottom of the lake or boat ramp. Once on the trailer, an outboard in the tilted-down position could allow the lower unit to hit or drag on the road. Occasionally, a motor’s propeller will foul with weeds, ropes or fishing line. Tilting the motor into the fully up position facilitates removal of whatever is caught in the prop so the boat can get back underway. When boat powers up from standing still to high speed thrust of the propeller suspended below the bottom of the boat causes the stern of the boat to push down into the lake. Trimming the motor to the extreme “down” position directs the thrust of the propeller upward to a small extent as well as forward, thus lifting the stern as the boat gains speed. The result is faster acceleration. Once the boat is up on plane, meaning it’s skimming across the water’s surface instead of pushing through the water, a motor trimmed completely down tends to push the bow of the boat down, now slowing the boat. To compensate, the helmsman can trim the motor up gradually until the boat rides fast and level. On a manually trimmed boat, the motor can’t be trimmed while underway. The boater needs to experiment with various trim settings to determine which gives the best combination of acceleration and high speed operation.